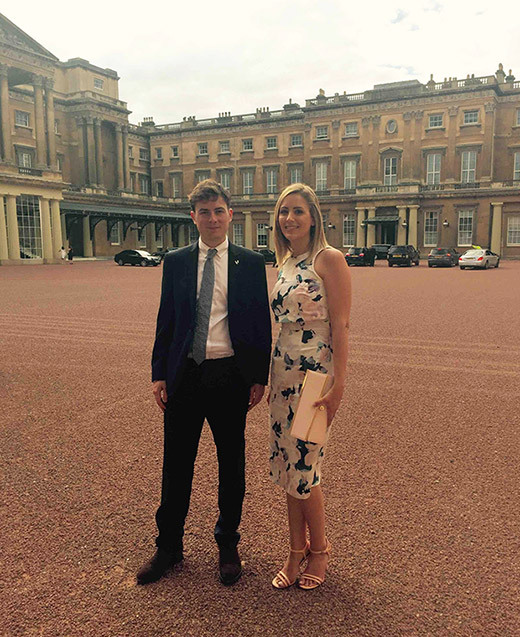 At the invitation of Her Majesty The Queen; Rebecca, ProSynths Commercial Manager and Karl, ProSynths Production Support Manager, attended the Champagne Reception for winners of The Queens Award for Enterprise. Accompanying Her Majesty was, the Duke of Edinburgh, Princess Royal, Princess Eugenie, Duke of Gloucester, Duke of Kent, Prince and Princess Michael of Kent. ‘From the moment we were welcomed through the gates of Buckingham Palace, past the Welsh Guards and into the quadrant; Karl and I knew we were in for a treat. We slowly made our way through the ground floor of the Palace, admiring the immediate grandeur, the artwork and vast collection of ornaments. We arrived at the top of the Grand Staircase and entered the Picture Gallery where we were handed a glass of Champagne. Whilst enjoying various canapes and the kind attendants never letting our glasses empty, we explored each of the surrounding State Rooms and looked over the views of the Palace Gardens. After an hour or so, we noticed out of the corner of our eyes subtle camera flashes and knew the Queen and members of the Royal Family had arrived. Not wanting to miss our chance we began to make our way towards the flashes, when a kind member of the house staff gave us a handy tip of where to position ourselves. We followed his suggestion, patiently waited and hoped it paid off. It was working, within a few minutes her Majesty was getting closer. One of the house staff approached us and four other delegates. He gave us a briefing on how to address the Queen. The Queen was picking up pace and missed out the first pair, we thought she might overlook us too. Heading straight for Karl, he made eye contact, opened conversation and aptly introduced ProSynth Ltd. Her Majesty turned to me and I explained that it was an honour to achieve such a prestigious award, and that our Managing Director had kindly chosen two of the company’s youngest employees to attend the reception. Her Majesty replied ‘very good’.